I made these sweet potato buns with the last of the veg from our CSA. They’re a lovely rosy color, have a crisp crust and a fine crumb. I added a little cardamom and paprika, so they have a subtle sweet/smoky flavor that seems to go with their color. Yesterday was a day of freezing dampness, and it was nice to have a fresh-baked bun at the end of it. Good with black bean burgers! Here’s Mikey Dread’s Hot Cross Bun to listen to as you wait for the dough to rise. Mix the yeast, sugar, salt and warm water together and leave for about ten minutes till it’s quite foamy. In a large bowl mix the flour, paprika, cardamom. Make a well in the center and add the egg, the oil, the mashed sweet potato, & the yeast mixture. Stir well, pulling it into a ball. It should be smooth, soft and a little sticky. Add more flour as necessary to make it handleable, and knead for about 7 miutes till it’s smooth and elastic. Put a drizzle of olive oil in a bowl, and toss in the lump of dough, turning to coat all sides. Leave it to rise for about 1 more hour. Form 8 evenly sized balls, tucking the ends under so it’s nice and smooth on top. Put on a lightly greased sheet, and leave for about 1/2 hour to rise once again. Bake in a preheated 450 oven for about 1/2 hour. Turn the heat down if the bottom starts to burn before the top gets nice and toasty looking. I sprayed cold water into the oven every five minutes or so. This steams the bun a little bit and ensures a crispy crust. 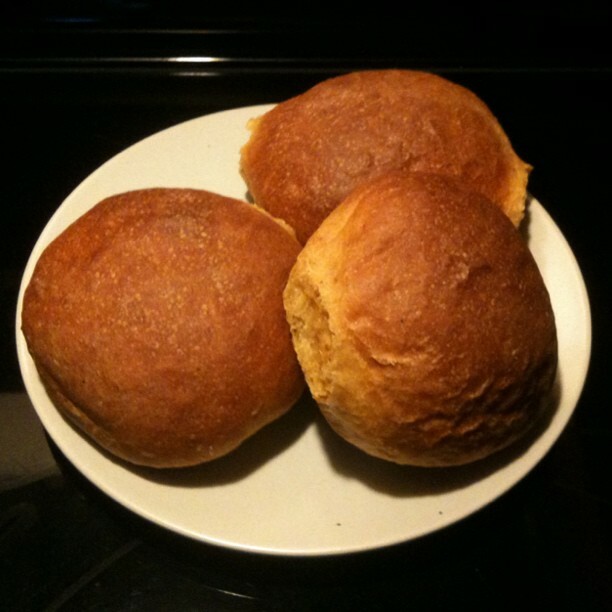 This entry was posted in bread, potatoes, recipe and tagged cardamom, sweet potatoes, yam buns, yeast buns by Claire. Bookmark the permalink. Wow, these look fantastic too. Thanks, Jeannie! I just made some black bean burgers to go with. Recipe tomorrow! !